Smith, Wilbur. Desert God. William Morris: 2014. Don't buy it, but if you must, do it here. Ever been tempted to write a series about a smug, all-knowing Renaissance Man? Don't. Just...don't. I can't think of many less appealing topics, but the indomitable octogenarian Wilbur Smith doesn't seem capable of letting his demigod-like Taita go quietly into the night. In Desert God, the world's least appealing polymath is up to his usual laughably improbable tricks, and it's worse than ever. I honestly can't remember the last time I started reading a book but gave up due to lack of interest (or indeed for any other reason!) before the end. 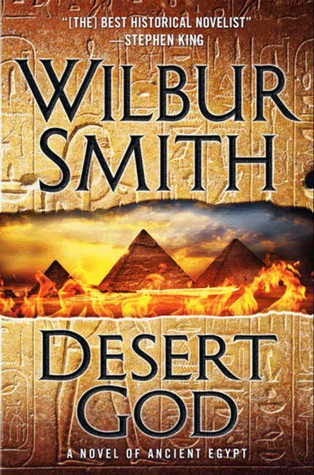 But then I encountered Wilbur Smith's books, and I've now gone 2/2. I want you all to know that I invested tremendous effort in my multiple attempts to read this entire book, and even went back and took a look at the first book in the series, River God, to see whether Smith used to be great but has just fallen on hard times (the answer to that is a resounding 'no'), but no matter how many times I gritted my teeth and tried to just power through it, subconsciously my mind kept leaping at the slightest distraction to get me doing something, anything, else. This deadly one-two combination of River God and Desert God temporarily drained the act of reading itself from all its joy, sucking the life out of every word. Reading either of these books is like sawing off your own arm: possible, with a supreme effort of will, but be prepared to faint out of horror and disgust countless times in the process. How you'll look if you keep reading Desert God. What is so bad about Desert God, you might be wondering? The answer? Everything. The writing is contrived and terrible, the characters shockingly uninteresting and entirely undeveloped (Smith uses his characters like a diarrhetic uses toilet paper), and the 'historicity' of the ridiculous plot makes me quiver with rage. 16th century BC Egyptians using "cavalry lances" to run down Bedouin bandits they've cornered after following their tracks—in the friggin' desert?!? (Caveat emptor: there are dozens more anachronisms and willful falsifications in this "well-researched" book.) The good guys get to run down 'the natives' and teach them what for...I guess 'Egyptian-colored' skin is the new white! And the utterly charisma-less character of Taita was a terrible idea, even for an author like Smith. Taita can do everything better than anyone else in the history of mankind, speaks all languages in the world or can learn any new ones in five minutes, he's like a billion years old but still agelessly beautiful, can apparently call in Horus/other supernatural forces at will (i.e., a deus ex machina whenever the plot demands), histrionically claims in the first-person narration that he's humble and would never boast and yet goes on and on about how wonderful/clever/etc. he is on practically every page, and is supposedly smarter than everyone else in the universe, but when the plot demands, he makes the most jaw-droppingly terrible decisions imaginable. This poop-fest is as bad as (check that: even worse than) Orientalist drivel like Shogun or other Clavell novels! Nerd coefficient: 1/10 "Yowsers—run for the hills!" This has been a public service announcement warning you of the unprecedented toxicity of Wilbur Smith's Desert God, brought to you by Zhaoyun, protecting humankind from the forces of darkness (and bad taste!) here on Nerds of a Feather since 2013.